We are proud to announce that we now supply and install USB integrated power points / charge points with dual sockets. Contact us today for a quote. General power point replacement with our USB power points will be approximately $150 per USB power point installed. Any modifications or for complete new power point installations will be at extra cost. Are you always losing your iPad, iPhone, Android mobile device charger? With our USB power point wall sockets you can save time and space! The wall sockets are available in various face plate styles to match your home. 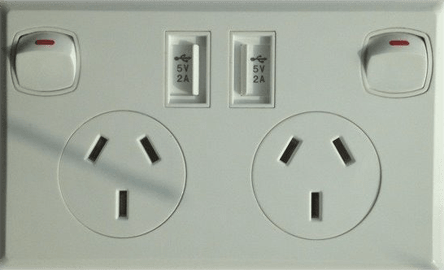 Canberra’s first USB Wall Socket Power point installation service.